Wish you could read more? Scribd is great easy way to read or listen to books. I’ve loved how it’s helped me get more reading done. Learn all about it in this Scribd review — plus get a free trial too! Several months ago, I happened across something called Scribd and it’s totally changed my life! I used to read a lot- in fact, it was one of my favorite ways to relax. But somewhere in between having 4 children, homeschooling, running my business (this blog) and doing all the hundreds of things that moms, wives, and homemakers everywhere do, I all but pretty much stopped reading. I mean, I’d pick up a book here and there, but I was doing good if I got three books read in a year! But Scribd changed all that. The last several months I’ve read three books each month! And it’s been so good to be reading again! Let me try to answer that and explain what Scribd is and why I love it. 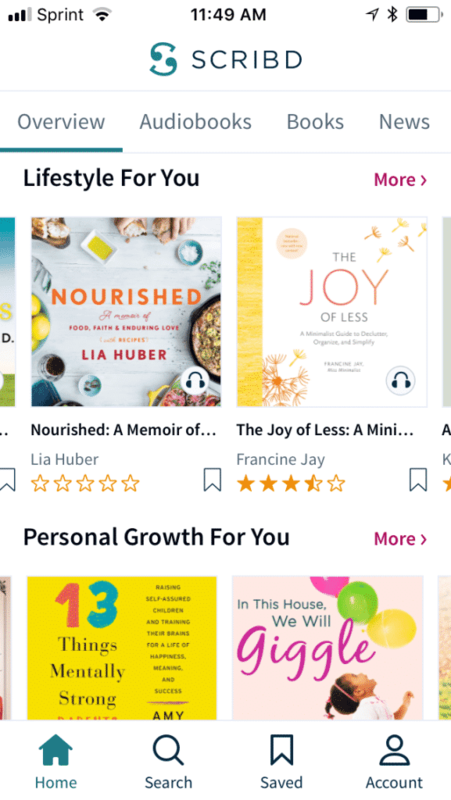 Simply put, Scribd is a digital reading subscription that allows you to read thousands of ebooks, audiobooks and magazines. Think of it as a Netflix for readers. Or, you could also look at it as a combination of Kindle and Audible, only better. Why is it better? Because it’s cheaper and offers more! How much does Scribd cost? You all, this is the part that I absolutely love. 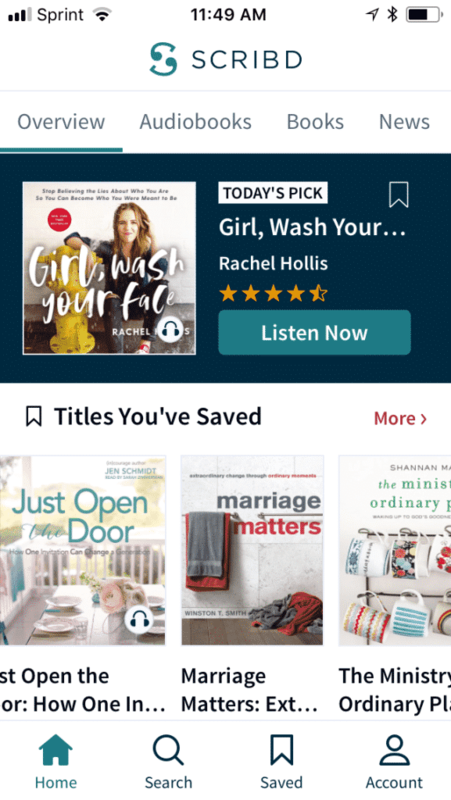 Scribd offers hundreds of thousands of ebooks, audibooks and magazines with no limits for just $8.99 a month! Did you catch that? No limits! And all for less than you’d typically pay for just one new book! That is what has sold me on Scribd. Can I get a Scribd free trial? Sign up here for your 30 day free trial of Scribd! What devices does Scribd support? It’s simple, really. 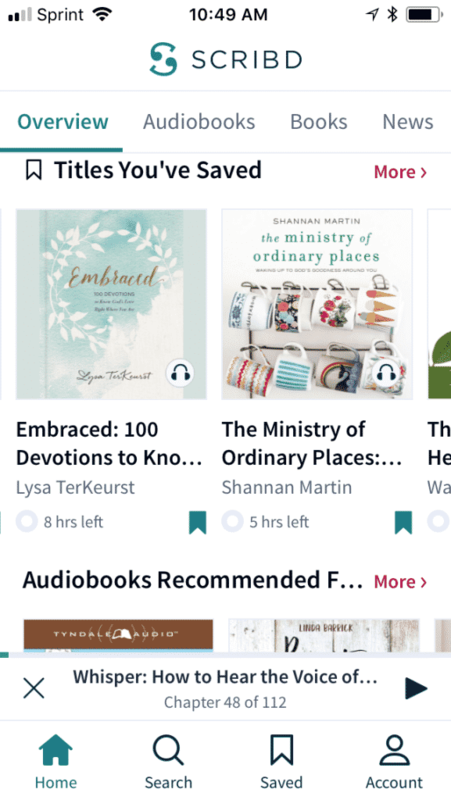 Once you sign up for your free trial, you can either go to Scribd.com on your computer or download the Scribd app on your device and get started listening or reading right away! To find a book, you have the option to search via title, author or interest. 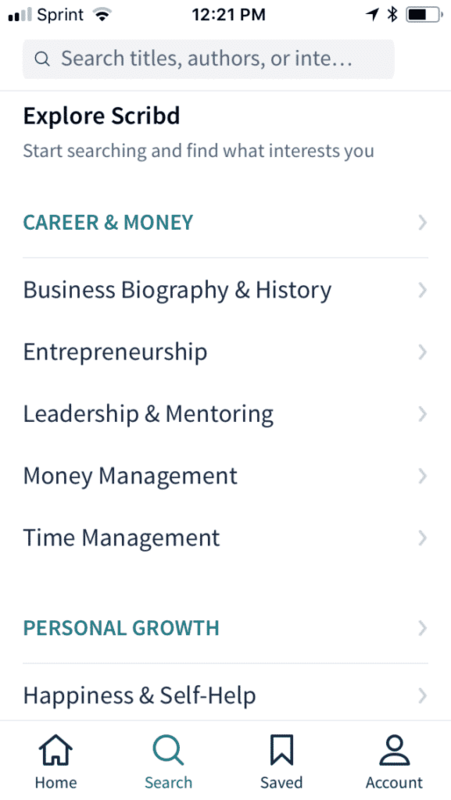 You can also look through relevant categories or browse through titles that Scribd recommends based off books that you’ve searched for or already read. The handy thing about the app is that you can download a book to your account and then enjoy reading it or listening to it even when you are offline. Downloading books to my phone and then having the freedom to listen to them anywhere has been awesome! In fact, it’s this feature that has allowed me to get so much more reading done. I’ve been able to listen to books as I get ready in the morning, while I run errands, on trips, and even as I work around the house. Since pictures are often helpful, here’s some screenshots from my Scribd app on my phone. It doesn’t have to. 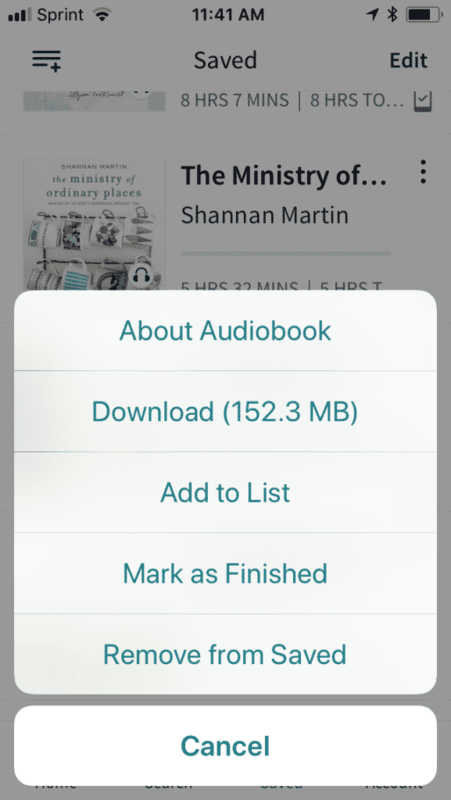 Because Scribd has the option of downloading audiobooks and ebooks to your devices, as long as you are connected to data when you do the actual downloading, you shouldn’t need to use any data to listen to or read your books. This was another feature that sold me, because my husband and I use an inexpensive cell phone plan that we pay around $35/mo. total for (and that’s for both of us together). We love it and it’s saved us a ton of money over the years, but to keep our bill that low, we do need to watch how much data we use. So I just make it a point to listen to or read only downloaded books when I’m not at home on our wifi and it’s worked great! Can you use Scribd on multiple devices? Yes! This is another feature that I really like! According to the Scribd website, you can save content on up to 4 devices, although they do say that depending on the agreements that they have in place with the books publisher, this may vary some. I have found though that I can switch between listening to a book on my laptop and then on my phone very seamlessly. 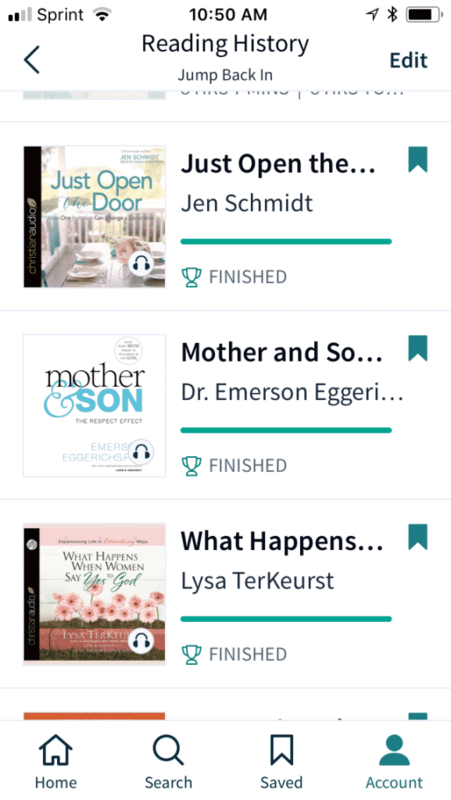 I also have a friend who loves downloading titles through the Scribd app for her kids to listen to or read on their tablets. Then if they are out say, doing errands with her and want to pick up where they left off, she can open her app and they can finish listening to the book there. How many books does Scribd have? And what genres? You’ll find over 1 million books from traditional publishers in Scribd’s impressive library and another 39 million titles that were uploaded by users- self published sorts of things. That’s a lot of reading options! You’ll find pretty much any genre you are looking for: personal growth, fiction, biography, literature, children’s and more! So far, out of the 40 or so books that I’ve searched for, only two have not been available on Scribd. And I think it’s worth noting that several of these books were new releases, too, which kind of surprised me! 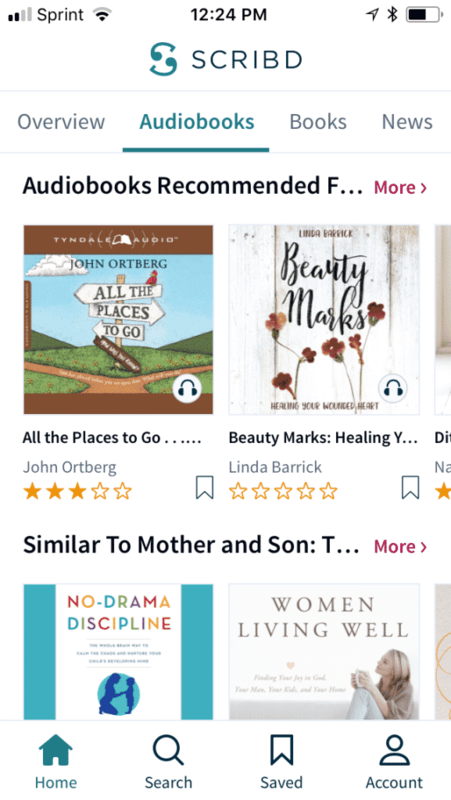 Is Scribd a good alternative to Audible? In my opinion, yes. 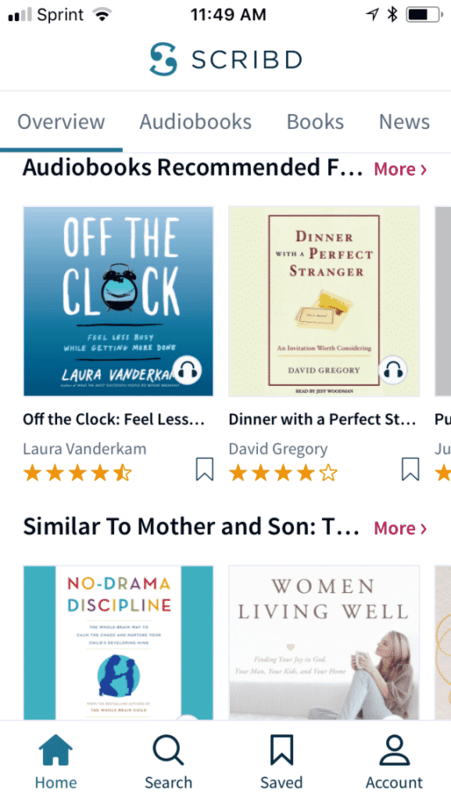 Audible costs $14.95/month for just one book. Scribd is only $8.99/mo. for an unlimited amount of books. The only reason that I can think of that you might want to use Audible instead of Scribd is if you really want to own the audiobook when you are done so that you can listen to it again another time. For myself, I much prefer having the option to listen to multiple books “on loan” so to speak. And if I do happen to really love a book and think that I want to read it again or have it on hand to reference something that was particularly helpful, then I just go ahead and buy a used copy from Amazon or Ebay. But I know some people love creating an audio library. So if that’s you, then Audible might be a better fit. Get your free Trial of Scribd! Interested in giving Scribd a try, click here to get your free 30 day trial! I am so happy that I stopped in to check on you. I recently was introduced to a set of books I wanted to read. Sadly, kindle unlimited doesn't have them. Audible only gives me one book and I read quite a bit. I checked and quite a few of the Audible type are available and a few of the hard copies. I probably won't keep it but two months but what a great deal. Money is pretty much mom existent the next two months. This will make my stay at home so much nicer. Whohoo! I love that you can read your newly found books with Scribd! I actually was like you and used it to read a bunch of books that I had been wanting to read but couldn't get from our library or get inexpensively on Kindle. But then I ended up loving it so much that it became my monthly splurge. :) Happy reading!